The government of India finally woke up to the scathing criticism levelled against it by none other than Thomas Piketty in February this year. Piketty talked about how there was tremendous income inequality in this country. He also stated, and rightly so, that the government’s inability to provide any data on income tax collections would hinder any understanding of the true state of poverty and inequality. 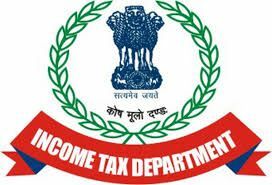 Why is it that even after 70 years since independence, only a small number of people come into the tax net of the government? It may be worth noting that in the financial year ending 2012, the number of tax returns filed by individuals and HUF (Hindu Undivided Family) income tax assesses was 28.8 million (see chart). Now compare this against the working age population of 768 million (Source: 2011 Census). Assume half of this number to be urban (working age) population. This is because half the population is engaged in rural jobs. This means that out of 384 million urban workers, only 28.8 million have been captured as tax payers. Assume another half of this number not earning any income at all. Even then the number should have been 162 million, not a paltry 28.8 million! True, some of them might not be required to pay taxes. But the law says that anyone who earns an income must file his or her tax returns. So have the authorities turned a blind eye to this law? Or are there other forces at work? Neither possibility is a comforting one. 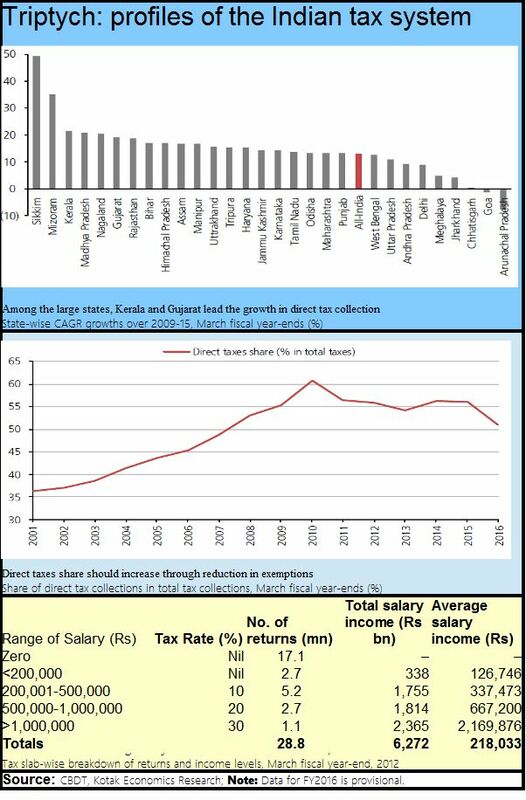 Another disturbing fact is that the share of direct taxes as a percentage of total taxes collected has been falling in percentage terms (see chart). Does this mean that the government has focused more on collection of indirect taxes, which hurts the poor much more than it hurts the rich? That is not the way to promote equality. Or does this mean that the government – after 2010 – has been promoting crony capitalism like never before? And do remember that the money that was not paid back to the banks is also income that goes untaxed. The privileged do appear to have enjoyed extremely huge benefits since 2010. And why is there so much of income inequality? Do note how the top 1% of individuals earn 13% of total salary income, while the bottom 50% of the individuals filing tax returns (excluding zero returns) earn just 20% of the total income. Then there is the issue of documenting rural incomes. While farm incomes are exempt from paying taxes, farmers are still required to file returns. Have the tax authorities even tried collating details about farm income? If the government’s track record in collecting electricity and water dues from powerful farmers’ groups is any indication, it is unlikely that the government will try and get farmers to start filing returns. It appears that the government will turn a blind eye to rural incomes altogether. But a re-look at farm incomes is critically important. This is because some of the top income earners in the country claim that they got their money from the farm sector. What is urgently needed is for the tax authorities to draw up a list on the highest possible profits that are possible from the most lucrative crops in agriculture for different areas (depending on soil, climate and water availability). If the income declared from agriculture on a per hectare basis is higher than this number, there is a good reason to believe that this is nothing but laundered money. There are good reasons to believe that this is not being done, because the individuals who claim the highest income from agriculture are often India’s elected representatives themselves. It appears that agriculture has become a huge laundromat – for whitewashing black money and for converting ill-gotten gains into legitimate (untaxed) income. Finally, watch the states which have registered an increase in tax mobilisation. As some bankers point out, growth in direct taxes is a sure indicator of a surge in economic activity. Among the larger states, watch how Kerala, Gujarat, Madhya Pradesh and Rajasthan have done well on this front. They are the ones that appear to have been pushing the right policies for economic growth. Also watch how Maharashtra has begun to lag behind. Unfortunately, the state has lost its vision. It spends a lot of legislative time and effort on non-productive policies relating to beef consumption and dance bars. It could have used this time and effort better in galvanising industrial growth instead. It won’t be long before it gets clubbed along with West Bengal, UP (Uttar Pradesh) and Delhi which have slipped below the all-India averages (see chart). 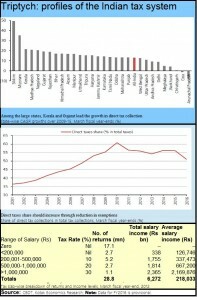 Clearly, the tax information that the government has just released has given India-watchers a decent peek into where the country’s policies are going wrong. Now the focus will shift on the Modi government to see what steps it will take to address some of the issues mentioned above. Next articleSurge pricing: Can everything be left to free markets and demand-supply equation?